Perfection begins with an extraordinary piece of diamond rough, selected to become an exquisitely rare diamond of superior quality and performance. Only a fraction of the world’s rough is suitable for the Perfection line. Our experts then formulate a blueprint for cutting Perfection with craftsmanship that, when applied to the rough, will release 100% of that diamond’s explosive beauty. Whether you want to shop loose diamonds for an engagement ring or diamond studs, we have some insider tips that will make your online diamond buying journey easy. When you want to buy loose diamonds, one of the first considerations is diamond shape. Diamonds are available in many shapes and each shape is uniquely beautiful. So whether you want to buy an emerald cut diamond or a round brilliant diamond, it is all about personal choice. The round cut diamond is the most popular, followed by the princess cut diamond. Both cuts maximize brilliance, flash and fire. In step-cut diamonds, the emerald and asscher cut diamond are quite popular. These diamond shapes focus on flashes of fire rather than the brilliance. The cushion cut diamond and radiant cut diamond have the brilliance of a round diamond in an unusual shape. If you like vintage jewelry, the oval cut diamond or the pear shaped diamond may be a good choice. 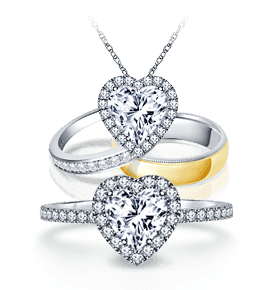 If you want a diamond with a distinctive shape, take a look at the marquise cut diamond or heart shaped diamond. Cut is one of the most important of the diamond 4Cs because the way a diamond is cut determines how much it will sparkle. The cut refers to the way facets or polished flat surfaces have been cut on the diamond. When light enters through a diamond, an expertly-cut diamond will refract and reflect the most light. So, better cut diamonds sparkle more. The GIA grades diamonds from Excellent to Poor. We always recommend choosing the best cut grade possible within your budget. When choosing loose diamonds, people are usually looking for the absence of any color or tint. 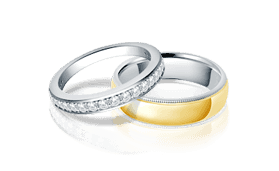 Diamond color is a rather subjective topic. Some people prefer bright white diamonds while others like the warmth of diamonds with lower color grades and so there isn't a definitive best color for diamonds. The GIA grades color on a scale of D to Z. The grade D signifies color-less diamonds, without the presence of yellow or any other tinge. Diamonds show more and more color as the grades drop to Z on the diamond color scale. Diamonds have some natural flaws called inclusions. The amount of inclusions present defines the clarity of a diamond. The clearer the diamond, the more it will sparkle and the more it will cost. The GIA diamond clarity scale starts with FL and goes down to I. Diamonds have more inclusions as the diamond clarity chart moves towards. Diamond carat refers to the weight of the diamond. One carat is equal to 200 milligrams. Diamond prices go up as the carat weight increases. But, the price does not increase proportionally. So, a 3 carat diamond does not cost 3 times as much as a one carat diamond but a lot more. This is because bigger diamonds are rare and cost more. A diamond certificate from reputed labs like the GIA, AGS and HRD is a mark of authenticity. These labs are independent and not affiliated with any diamond retailers. When you buy GIA certified loose diamonds, AGS certified loose diamonds or HRD certified diamonds, the certification or lab reports are universally accepted. Loose diamond prices are a result of all the 4Cs and the certification. 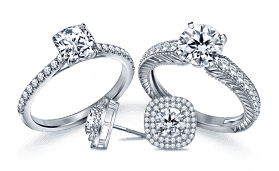 To find loose diamonds that fit your budget you have to decide which of the 4Cs is the most important to you. If diamond carat is your priority, you could choose a diamond with a G, H or I color grade, rather than the premium D, E and F. For some, a lower color and clarity is a good trade off for a larger carat weight and better cut. If you're planning to propose, then the date of delivery is very important. B2C Jewels provides an estimated shipping date for all our loose diamonds but it is advisable to call our customer support team at 1-866-522-2539 to find out exactly when your diamond will be delivered. The digital certificate copy for this diamond is not loaded. Please give us your details and we will email you the certificate.